Be the first to share your favorite memory, photo or story of Cindy. This memorial page is dedicated for family, friends and future generations to celebrate the life of their loved one. 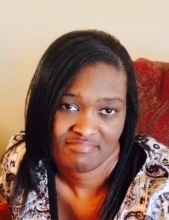 Cindy A. Kindrick, 39, of Parsons, passed away Wednesday, January 23, 2019 at her home in Parsons. She was born at Rayville, Louisiana to Lanny Natt and Gloria Kindrick. She grew up at Rayville and Parsons where she attended schools there graduating from Parsons High School in 1999. Cindy volunteered at Southeast Kansas Independent Living Center as a disability advocate. She successfully advocated for the installation of handicapped accessibility at various apartments in Parsons. Cindy loved spending time with her family and having family cook outs. She was new Orleans Saints fan and enjoyed the friendly rivalry Dallas Cowboys fans within the Kindrick family. She also enjoyed going to the casinos. She leaves to cherish her memory her father, Lanny Natt of Parsons; her siblings, Bobby R. Kindrick of Parsons, Cassandra Harris and Larry Harris of Parsons, Angela Thompson and Roger Thompson of Parsons, Victor Kindrick and Patrice Kendrick of Parsons, Nicole Burges and Marcus Burgress of Parsons, Lanny Natt Kindrick, Jr. of Parsons, Marilyn Kindrick of Parsons, Lance Banks and Kimberly Banks of Rayville, LA, Joyce Kindrick of Parsons, and Cindy’s boyfriend, Harold White of Parsons; and a host of nieces, nephews, cousins, and friends. To send flowers or a remembrance gift to the family of Cindy A. Kindrick, please visit our Tribute Store. Funeral services will be held at 11 a.m., Saturday, February 2, 2019 at the Carson-Wall Funeral Home with Larry Harris officiating. "Email Address" would like to share the life celebration of Cindy A. Kindrick. Click on the "link" to go to share a favorite memory or leave a condolence message for the family.